Are you looking for an efficient, no-nonsense self defence programme, focused on giving you fitness, health and wellbeing – for life? Our training has been specially designed for adults, to help you relieve stress and get fit in a fun and enjoyable environment. Our adults’ programme is multi-faceted – it works on you physically, mentally, emotionally and spiritually. Physical shape: get the body you’ve always wanted. Choi Kwang Do will help you lose fat and gain muscle, redefining your body shape in a positive, fun and supportive atmosphere. Physical strength: if you ever need to, Choi Kwang Do will enable you to defend yourself. That is true for women just as much as for men. The martial arts moves you will learn will arm you with a sense of security. 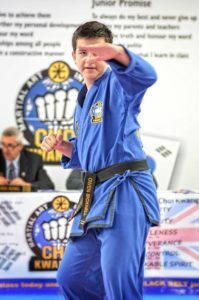 Mental strength: the discipline that underpins Choi Kwang Do, and the goal-orientated nature of our programmes, will develop your mental strength. This will spill over into all areas of your life, enhancing your work practices, your relationships and your achievements in every other sphere. Emotional development: self-esteem can be an issue at any age, but you will sense from the above that Choi Kwang Do will give you a hugely enhanced sense of self, and feeling of self-worth, that your self-esteem will be transformed. 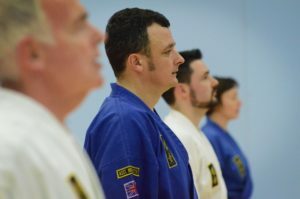 Emotional support: in Choi Kwang Do, we work together – there are no winners and losers – and we all – instructors and other students – support each other to achieve our goals. Spiritual development: many students, who come to Choi Kwang Do for the physical benefits, discover in time that these broaden into mental, emotional and even spiritual areas. 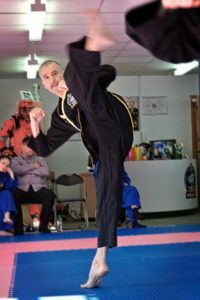 A heightened sense of enlightenment is not mandatory, but every student will feel differently about themselves and the world through Choi Kwang Do. Will I get hit? No, there is no sparring in CKD because we believe that it only induces aggression and stress. Competitive sparring encourages you to stand toe-to-toe with an assailant, usually conducted under a set of safety rules and often controlled by a referee. This scenario is far from the reality of a real-life assault and bad habits can easily form under these constraints. In CKD, we gradually introduce you to a series of structured ‘Defence Drills’, to develop your skills of deflective blocking and avoidance. Your partner will simulate an attack at an intensity gauged to allow for the development of countering techniques – aimed at disabling your attacker and enabling evasion. Do I need flexibility to kick high? No, our practical and effective techniques only require a natural range of movement. Your flexibility will develop naturally and without conscious focus, as you engage in the numerous drills we teach you. Our warm-up stretching component, at the start of each class, will ensure your flexibility makes steady progress as you train. However, kicking high is not a requirement and is considered generally impractical for self-defence purposes. How often do I come to class? That is entirely up to you: some students attend once a week; some come every day. Whilst it is true to say that the more you practise, the faster you will develop, why not start slowly and build up? Do I need to be fit to start? Whilst we would always support a healthy, active lifestyle in everyone, no, there are no pre-requisites at all. We will make sure that the classes you attend and the exercises you are asked to do, are appropriate for where you are now. Can I try it? Yes, you – and we – need to make sure that your needs and goals match our programme, so we would start you on a trial programme. Why not try it out? We cannot do the benefits of Choi Kwang Do justice in words, so why not book a free introductory class and see for yourself what you could achieve. Please call us free on 0800 990 3071 where we guarantee to greet you with a friendly welcome. I have used this organization for our Wednesday afternoon senior games sessions for the past two years, giving our students the chance to enjoy a different educational activity while remaining active throughout the spring term. The agreed scheme of work followed is both comprehensive and thorough and takes students through a really enjoyable range of different skills and ideas. These encompass a range of life skills including self-defence, that pupils will take with them beyond the classes and beyond the school. The classes are active and encourage our pupils to think outside of their comfort zone while working towards increasing their knowledge, skills set and a healthy balanced lifestyle. Hampshire CKD has become a valuable asset in the production of a range of activities for senior games, and I fully endorse their use across the whole age range (2-18) here at St John's College. Derek, Karen and Liam Bicknell put together a bespoke programme, where over the course of the day each of our 284 students were put through their paces in a 'stress busting session' for an hour. We have used Hampshire CKD for our Personal Development sessions on our first day back at school with Year 8 students for the past two years. We have been delighted with the support and service from Derek, Karen and the team. Derek and Karen met with me to discuss and tailor the skills for the sessions and produced a bespoke programme which suited the needs of our students. We had some students with additional learning needs and they were well catered for and included in the activities. We opted for a basic skills and active stress-busting session to give the students a taste of self-defence. Throughout the planning and on the day itself there was a clear emphasis on professionalism, health and safety and building relationships. The team of instructors who accompanied Derek and Karen were fantastic. They were highly professional, approachable and had a wealth of expertise. I had complete confidence in all of them. Our students LOVED the sessions – they were active, engaging and full of positivity. 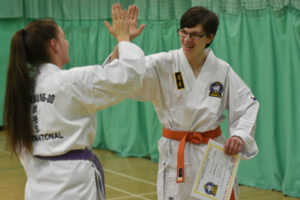 The students came away with a feeling of success, self-discipline and confidence. Each movement was well explained and demonstrated and then the students had a chance to try it for themselves. They really felt like they had achieved something tangible and valuable. They said it was one of the best ever sessions that they had had. Hampshire Choi Kwang Do goes beyond self-defence; it builds confidence, skills and shows young people how self-control and respect for others is a vital part of their personal development and can have a huge influence in their relationships and their studies. I would highly recommend Hampshire Choi Kwang Do to any school, club or parent who wants their young people to experience a martial art which provides exercise, self-defence, respect for self and others and dedicated instruction.